The decision to act was in itself the beginning of the journey. A young woman’s journey of self-discovery across the Outback. It’s a description that could be aptly applied to Walkabout, but it also fits this oft attempted – but hitherto unsuccessfully, can you imagine the Julia Roberts version without shuddering? 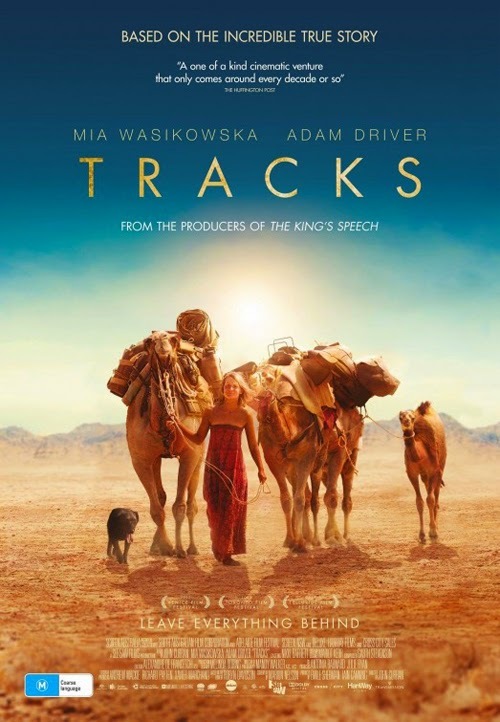 – adaptation of Robyn Davidson’s novel. 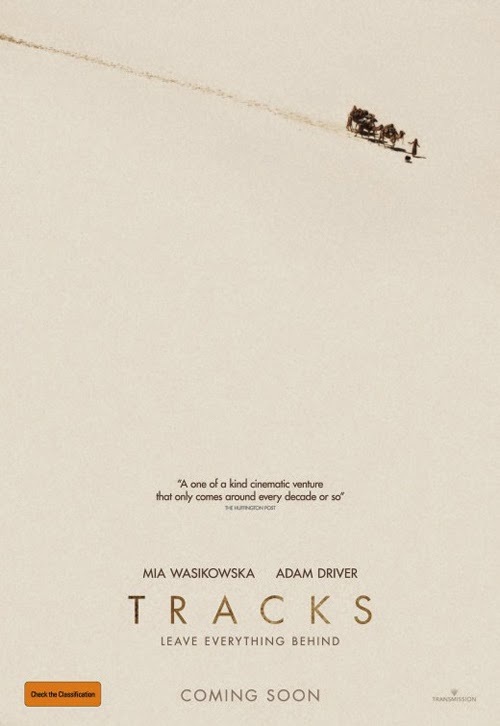 Tracks is a very different bactrian to Nicolas Roeg’s classic rites of passage tale, and takes a literal, methodical approach to its trek. Surprisingly, this staunch linearity (how else would one depict a quest, one might ask), so typical of the biographical movie, is not a drawback; John Curran’s film unfolds measuredly, slowly weaving its spell as it encourages us to embrace the barren beauty of Davidson’s expedition. And in Mia Wasikowska he has found a naturally sympathetic lead, inviting empathy with the sometimes-difficult protagonist. Davidson was compelled by a nomadic yearning to embark on a 1, 700 mile trek from Alice Springs to the Indian Ocean. No one thought she could it, and tried to dissuade her, but as she says at the start, there are two kind of nomads; those at home everywhere and those at home nowhere, and she is the latter. Davidson just wants to get away from people, and her plan involves travelling the route with a quartet of camels and her faithful hound Diggity. Her fitful attempts to get started take up a portion of the opening passage,as she gets fleeced by a disreputable camel farmer who doesn’t make good on his promise to pay her in the animals. When finally she sets off, it looks initially as if director John Curran and screenwriter Marion Nelson have misstepped. Robyn’s journey looks as if it will be entirely defined by her monthly meetings with National Geographic photographer Rick Smolan (Adam Driver, fast becoming ubiquitous, but nothing like as ubiquitous as the ubiquitous James Franco; luckily, and surprisingly, he doesn’t show up), assigned to record the foot-first feat. This serves to more than establish her frosty façade, giving the haplessly well-meaning fellow continued short shrift, but it seems as if they are missing the point of what she is doing. Not to fear, as once Curran really gets underway, and Robyn encounters an Aborigine elder who leads her across their sacred ground (women are not allowed unaccompanied), we see a different, more accepting side and with it the picture hits its groove. When she sets out into the vastest stretch of desert, where Rick has very decently laid a trail of water cans lest she perish, the picture even allows itself to slip into an unfussily meditative gear. Robyn is (literally) unfettered – in one scene she has her own Jenny Agutter bathing moment - and enters her own altered state of abandon amid the desolation. Her most eventful encounters – an attack by bull camels, her camels making off without her one morning, the horrible fate that befalls Diggity – provide some dramatic meat but Curran is mainly content to allow the picture to be what it is, to meander when it needs to and not push it along or pep it up. I enjoyed his two previous pictures, The Painted Veil and Stone – both with Edward Norton – very much, and this might exceed either. We reach the point where, rather than wishing Robyn would spend time with those she encounters, we want her to leave them as soon as possible so she can be free again. For all its great untamed expanse, the desert is a place of (mostly) safety and comfort. So when a crowd of noisy reporters sets upon her, desperate to interview “The Camel Lady”, the distress of one who has spent so long in solitary contemplation is palpable. Curran is too smart to attempt a dissection of what goes on under Robyn’s lid; his trick is that he enables us to empathise with her doing what she does rather than overtly explaining it. That said, there is an undercurrent of cod-psychology in the unnecessary flashbacks. They are a bit eggy, leading us by the hand (do we really need the fateful departure of her childhood hound as a foreshadowing of the incredibly upsetting demise of her current pooch), when it might be more satisfying to allow us the benefit of speculating as to her drive (the unfortunate effect of the flashbacks is that they suggest she does nothing but think about the loss of her mother, and going to live with her aunt; there’s clearly much more backstory as we discover when she happens upon a kindly sun-beaten farming couple, that isn’t directly to do with those events). The picture is better at making us conscious that the adverse consequences that come with her strong-willed decisions, not out of overt criticism but because to illustrate that to do what she wants to do she must also face what she really doesn’t, be it having her male camel castrated, angrily beating him after he runs off, shooting the male bulls or having to put down Diggity. Wasikowska is outstanding in the lead, and it’s with her solo that we spend the majority of the picture (with an accompanying menagerie, of course). At first Robyn’s voiceover announces itself in an off-puttingly over-written manner, a mouthful of words, but that in itself works in fostering a gradual appreciation of her. If we aren’t invited into Robyn’s inner world, Wasikowska makes those things that bring her peace and validation more than clear. Driver is lends strong support as the likeable goof towards whom Robyn gradually thaws. Roly Mintuma’s Eddie, persuasively benign and ever chatty to an uncomprehending Robyn, also makes a strong impression (this might be the most upbeat section of the picture). Then there’s Diggety, charmingly played by Special Agent Gibbs; there’s a lovely uplifting scene in which Robyn, searching for her compass, is unable find her way back to the camel train; she instructs “Diggity, go home!” and the faithful hound leads her back to them. Mandy Walker, who lensed Australia for Baz Lurhmann is given the chance here to allow the desert images to linger and sing. It’s a gorgeously shot film, with vistas both familiar (a flickering mirage) and uncanny (a motorcyclist arriving out of the darkness like an astronaut stepping onto the Moon; he may as well be from a dream world to Robyn, who turns over disinterested in his prattle and goes back to sleep). Garth Stevenson’s percussive score is also a perfect match, gently pushing the picture forward but holding back on the urge to get overly inspirational.